The first 75 members who sign up will get a free ticket, and access to one half-price ticket (your price, $11 for a $33 face value seat) for a family member or friend. No business agenda for this night, only a chance to sip a beer or lemonade among friends and wait for a foul ball in your lap. Because of timing needed to get final payment to Rockies, we need all those interested to sign up by June 15 and get payment to Mike Booth or the Guild office by then. Please make a firm commitment in signing up — the Guild would rather eat hot dogs than unused tickets. 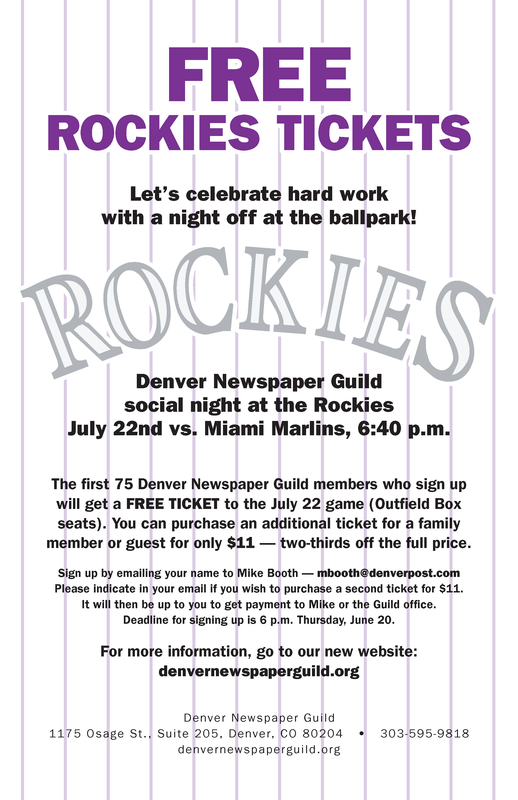 Sign up by e-mailing mbooth@denverpost.com, and please tell your friends in all Guild locations. I’m really looking forward to a great night of baseball with good people and ball park food. Gotta love summertime!